Dairy Queen's November 2013 Blizzard of the Month is the same as October's. 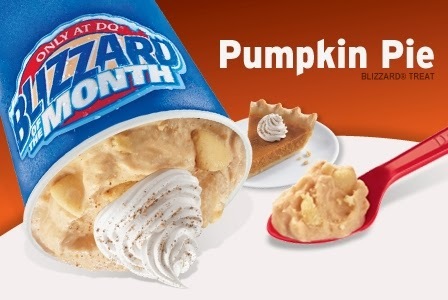 That's right, the Pumpkin Pie Blizzard is once again the Blizzard of the Month. The flavor features pumpkin pie pieces (crust and filling) blended into vanilla soft serve and completed with whipped topping and nutmeg. Like last month, you can get also get pumpkin pie added to the Royal Shake or have the Pumpkin Pie Blizzard in a waffle cone or as part of a Blizzard cake. 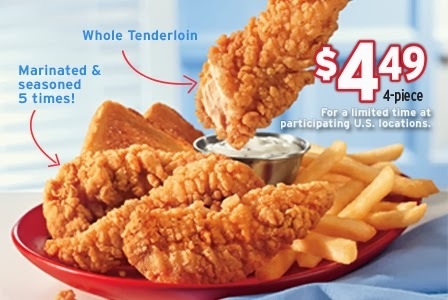 In other promotions, the $5 Buck Lunch promotion is still ongoing and they've added a $4.49 Chicken Strip Basket for a limited time. It comes with four white meat battered and fried chicken strips, fries, Texas toast, and your choice of dipping sauce. Of all the ideas Taco Bell comes up with..they implement the chili fries one? Sheesh. I take opinion surveys for food ideas from them frequently. For some reason I knew they would put this out instead of some of the better ideas they present me. Also...why are their grillers $0.79?!? I haven't had a Loaded Griller ever since they increased the price from .99 to 1.29. Don't care to go only during Happy Hour just to get them for .99. I haven't eaten at Taco Bell in a while. I would like to try these with some cheese nachos.